This Civil War fort, named for Gen. Joshua Blackwood Howell (1806-1864,) was built by the U.S. Army’s 32nd Colored Infantry and the 144th N.Y. Infantry to defend Hilton Head and the nearby freedmen’s village of Mitchelville from potential Confederate raids or expeditions. That village, just east of the fort, had been established by Gen. Ormsby M. Mitchel in the fall of 1862 and was named for him after his death. The fort was an enclosed pentagonal earthwork with a 23-foot high parapet and emplacements for up to 27 guns. 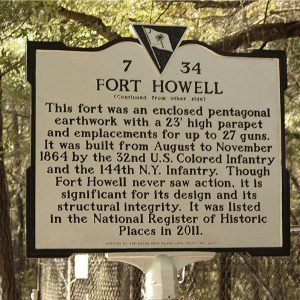 Though Fort Howell never saw action, it is significant for its design and its structural integrity. It was listed in the National Register of Historic Places in 2011.